It was super nice and really clean other than the fact that they were renovating but that wasn't really a problem either. We got given a free upgrade and everyone was so friendly and helpful. The free pancake breakfast was also great ! A fantastic location and really great place to stay despite renovations. Perfect location. Staff are really friendly and helpful. The hostel have day and night activities which are great for meeting new people. Even HIIT fitness training twice a week with nick on the beach front which is great. Also yoga. Hostel really clean . Slightly annoyingess is the construction work going on and wakes you up with drilling at like 7am everymorning! Deffo would recommend this hostel and would stay again. Really nice location. The hostel hosted events everyday and night. Not too many nights out to bars in the city though. Definitely enjoyed my stay here and would stay again next time I’m in Bondi. Nice place with good activities such as yoga/decent bar crawls made it easy to meet others when I was by myself. However, saw some cockroaches. Also, it was good that they had bag storage but it wasn’t secure and anyone could walk in to it. 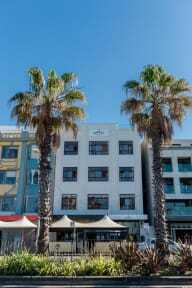 Lovely hostel right on Bondi Beach with great views from reception. Sadly the roof was closed for maintenance so didn’t get that view, however friendly staff, had the normal Aussie hostel issue of a bit of a clique of longer term residents but lots of friendly solo travellers. Good spacious room with storage and locker. Showers were great, kitchen facilities very good. Nice sociable environment. Ended up staying four nights, was a great base for exploring Sydney with regular buses just opposite. Undergoing major renovations which no one was told of before we arrived! Woke up in a female dorm one morning to a team of male construction workers in our window, which had no blind, and all over the bathroom corridor. At one point we couldn’t even access our room because the whole floor landing was torn up. Smelled like paint and full of dust. Also two female toilets per floor and super shaky bunk beds. Only plus was the location. Everyone was lovely but our private double had a foul smell and there were roaches all around. Possibly due to a massive amount of construction but still pretty gross.